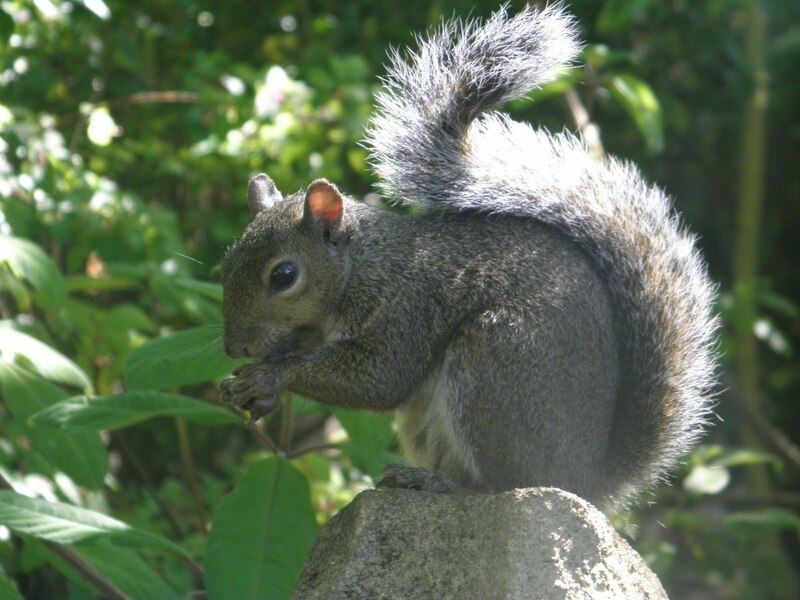 Though we are not suppose to feed the squirrels at the gardens, it is always something I enjoy. After all, they do need "good eats" every once in a while. This particular day I brought honey roasted nuts. There were not as many squirrels around as usual, maybe because of the hot weather. So, when I found this little guy in one of the demonstration gardens I decided to let him have the entire bag. He was a bit afraid of me at first but when I piled the nuts in front of him we became instant friends. He even let me take a short video clip of him which you can see below. He was a cutie. For more cute critters, click the above widget. He is cute and he sure was enjoying those nuts. It is a cute little thing. Adorable. Too funny, Jo, my post today was also about the squirrels. This one is great!! There are no squirrels in New Zealand. I am amazed the way his tail curls to shape his back. You give out good treats. I'd follow you around too. Great capture. eeeeeeeeeep! so cute! Good thing it didn't walk away from you while you were taking its video! I'm amazed at how fast it chews! Very cute and he seems to be thoroughly enjoying those nuts! We have two squirrels that live in one of the trees in our backyard. They're so fun to watch as they run around the garden. We have squirrels everywhere! They have plenty of natural food to eat in our backyard, so we try hard NOT to feed them. I am going to tell on you! LOL. I think sometimes they say that to the protect the animals from people feeding them stuff they could die with. Love the candid shots. What a wonderful and cute picture of the squirrel. The video is so enjoying to watch! Fantastic shot, and wonderful video! i can't blame you... he's so cute. i would feed him too. Thanks to all of you for visiting and sharing your thoughts. I'm glad you liked this little guy or girl. It was fun to share this post with all of you. Have a great weekend everyone. What a cute little fellow. I hope, the entire bag of nuts will not make him sick. You are so lucky that he posed for you for this lovely little video. Love the cute curl of this little squirrel's tail! Lovely photo! I am such a sucker for squirrels. We have so few here that I seek them out to watch! love how the tail curls against it's back then flicks out... the profile shows it off really nicely. Great photo and fun video.